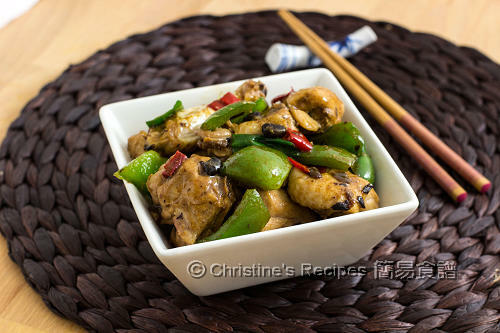 This chicken in black bean sauce is quite popular in my good old days living in Hong Kong. 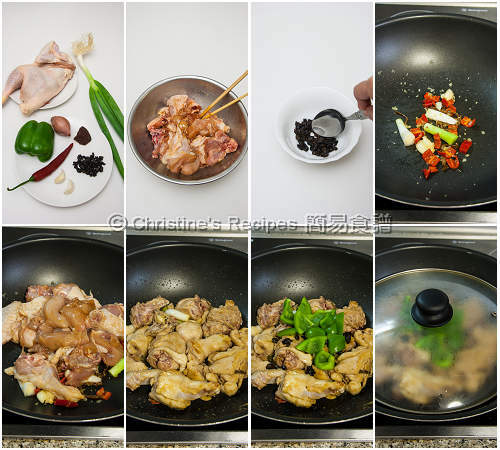 The chicken is cooked just right in time, in the black bean sauce, in order to keep its tenderness. 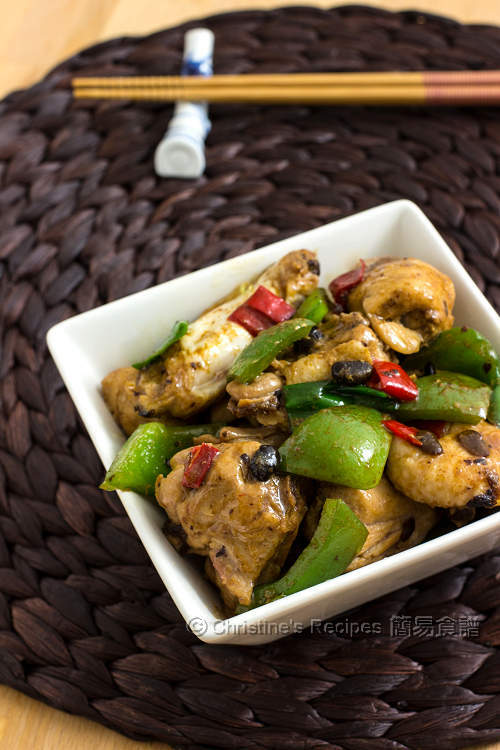 The cooking chicken time is just right, so the meat is not over-cooked, but very tender and moist, with the fragrance of fermented black beans imparted through the sauce and chicken. To get the best results, chicken with bones is often used. I also added a small piece of dried mandarin peel to increase the fragrance. They go together perfectly taking the whole dish up a level. Rinse the chicken and wipe dry with kitchen towel. Cut into small pieces. Mix with the marinade for about 30 minutes. Rinse the fermented black beans. With a tablespoon, press it into a paste. Set aside. Soak the dried mandarin peel until softened. Scrape away the white inner layer with a teaspoon and slice into thin strips. Cut spring onion into sections, with green and white parts separately put aside. Heat oil in a wok or frying pan over medium high heat. Saute the shallot, garlic, red chilli, mandarin peel and white spring onion sections. Add the marinated chicken. Stir fry for a while until the chicken is cooked half way. Add the fermented black beans and capsicum. Cover and cook for about 8 minutes, or until the chicken is cooked through. Stir in the green spring onion sections. Serve immediately. You don’t need to press the fermented black beans into a smooth paste. Retain some texture to enhance the presentation. As the chicken contains some moist, by cooking with cover in its own juice will make the dish more flavoursome. Beware of the stove heat level though as you don’t want to get your chicken burnt. Be cautious that fermented black beans cannot be burnt. It tastes bitterness otherwise. You only want its fragrance impart into the chicken meat. The hotness of different kinds of red chilli is so different. Choose the one you’re into. I chose the one with mild hotness. It used to be my favourite too! Now you have me crave some, Christine.